Solvents used in the liquid electrolytes of the Lithium-ion cells are very sensitive to water vapour, and will react to create hydrofluoric acid (HF). When sealed inside the cell, this strong acid will erode the film which isolates the cathode and anode, and can potentially cause short circuits and, in some cases, fire. Keeping the air in the production room sufficiently dry to avoid the build-up of HF is not easy: the moisture from the operators’ breath and skin can easily raise the humidity above an acceptable level if conditions are not tightly controlled. Therefore, moisture is one of the most important parameters to monitor. To ensure highest product quality the manufacturing process of lithium batteries needs to be carried out in very dry conditions. To remove the excess moisture from the atmosphere in the production area very dry air – at around 60°C dew point – is delivered into the production room at one end and removed from the other to produce a flow. Because of the moisture emitted by the production operatives, when it leaves the room the dew point of the air may be raised to around -40°C. Rotary desiccant dryers are used to remove the additional moisture from the air and recycle it. Because even small changes in the humidity levels of the room can have a detrimental effect on the quality and safety of the cells produced, conditions in the production environment need to be continually monitored to a highest possible precision. In one production facility in China, a total of 15 S4000RS chilled mirror hygrometers are installed at various points in the room to monitor the dew point. At another site – 8 S8000 Integrales are used. The instruments are used as part of a control system, which changes the flow of air through the dryers depending on the measured dew point. If the levels of moisture in the air rise above an acceptable level, the instruments trigger an alarm, to alert operators that manual intervention is required. The S4000 RS was chosen for this task because of its ±0.1°C dp accuracy. 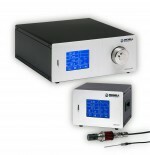 It is capable of precisely measuring from -85°C to +20°C dew point which means that it is also highly reliable at the key -30 to -60°C dew point levels needed for the application. The S8000 Integrale is also appropriate, and achieves these measurements with no additional cooling, which makes it highly compact. This is an important consideration in manufacturing processes where space is often at a premium.